It might be a study. It might be a workout room. It might be a garage with a ratty recliner and TV. Wherever "it" is, it's the place in your home where your husband can go to relax. Pop psychologist John Gray dubbed it "the cave." I call it "the man room." We SAHMs may have trouble setting aside this space; after all, we're the ones at home all day! The smaller your house, the harder it can be to surrender that empty corner. I say, the smaller your house, the more important it is that your husband have a cave! It's not just a gesture of respect. It's acknowledging that he is more important than your sewing machine or antique furniture. It's about giving him a place to renew without feeling the pressure of family. If you've ever had a toddler attack his leg upon entering the door, you know exactly what I mean. The man room doesn't have to be big. It just has to be his. 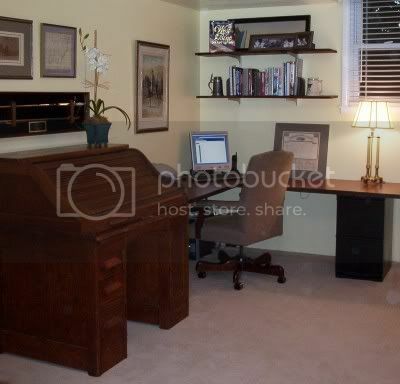 Our other homes had only a small corner or a dining nook-turned-study. In this house, we converted the one-car garage. Oh, that big blank space! Before I knew it, I was painting the walls yellow and putting a pastel silk sectional on hold at The Clearinghouse. Thank goodness I came to my senses. I see the man room as an investment, and not just in my marriage. Every time we've toured a house, I observe an interesting phenomenon. My husband uses an inner radar to find the seller's cave. If there's a big TV or sound system, he examines the wattage and wiring. If it's a lovingly organized toolshop, his eyes glaze over. I wish I had had a camera when we stumbled upon an indoor basement gun range! I used to laugh at this behavior; after all, I like to think my husband has slightly higher aesthetic sensibilities than the average man. But it happens every time. Realtors assert that the woman buys the home based on the kitchen and bath. That may be true, but it's a lot easier to convince her husband if the home isn't cloyingly feminine. How much faster will he agree if he can picture himself relaxing in a space just for him? At the very least, make sure you have a man-sized chair and reading lamp in your living room. Fan the latest issues of "American Angler" attractively on its end table. Don't ban your husband's treasures in pursuit of the perfect home. Give up your Victorian guest room and make it a study Sherlock Holmes would enjoy. Instead of wincing when he brings home a plasma TV, grab your measuring tape. Display those electronics with taste, and you might just earn your money back when the next male buyer walks through the door. I love the "man room". We've been married for 33+ years and my husband has had a spot someplace in every home we have lived it. Sometimes it was an entire room, once it was a converted closet. He likes to have a place to go and study his Bible or read or listen to the radio with out me. He is also very left handed so evey thing is placed just right for him while I am right handed. You're right, men walk into a house and want to know "Where can I hang out". After all we wives get the rest of house, he can surely have 1 room/space that is just for him! He is worth it after all. Great picture by the way. I love reading your blog. Keep up the good work. Thanks! I thought you meant BATHROOMS had to appeal to men. My husband has a man room, off the back of the garage, heated, drywalled, wired for all kinds of electrostuff, and wall to wall books. Incidentally, my husband always checks the flushing POWER of the toilets, and legroom. No water-savers for him! What a great idea. I'll have to figure out how to convert a corner of our apartment into a man room. My DH calls his room "The Nerdery". I laugh every time he says, "I'm going to retire to the nerdery." He has a metal green desk in there. Much like those old military desks. And I big wooden chair.